After months of research and deliberate planning, you have decided to migrate to NetSuite, the #1 cloud ERP software. With over 40,000 organizations worldwide using NetSuite, it’s undoubtedly one of the most successful and popular ERP systems. Comprehensive functionality for businesses across verticals, a vast array of resources, lowered implementation costs, minimal disruption to your business flow – are some of the top benefits of NetSuite. But, then how do you ensure that your NetSuite implementation continues to remain relevant and flexible, as your business scales? This is where – NetSuite’s Built-In Flexibility comes into the picture. One of the biggest benefits of NetSuite is that it’s highly flexible. As a business owner, you would be aware that your business processes change rapidly, with the times. As your business grows, you are likely to face more complex challenges. The major benefit of NetSuite is that the system evolves along with your business growth, and can easily adapt to new business models. 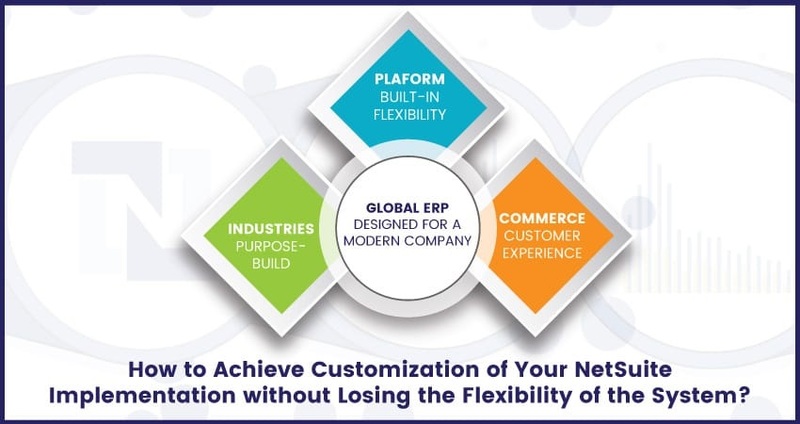 NetSuite lets you tailor your ERP system perfectly to suit your evolving business requirements. The best part – you are in complete control as to when and where you opt for customizations. And, when you upgrade your ERP system to the latest version, all your business-specific configurations and customizations are migrated seamlessly from your old version to the new version. There’s no chance of version-lock and incompatibilities between different versions. With that said, you need the right NetSuite implementation partner, to ensure that your NetSuite system continues to remain flexible over the years. How to Ensure that your NetSuite System Remains Flexible, Adapting to the Needs of your Business? To keep your NetSuite system flexible – you need to avoid hard-coding customizations and business-specific requirements. The inherent nature of NetSuite is that it requires no hard-coding and customizations are straightforward and easy to implement. NetSuite was designed to be a flexible solution for businesses, and it is highly scalable, as the business grows. If your NetSuite implementation partner suggests hard-coding for your organization-specific customizations, then you may opt to get a second opinion, to avoid losing the flexibility of the system. By avoiding hard-coding of customizations, you don’t have to depend on the same vendor for changes to the system in the future. Changing your business logo/address/telephone numbers and other details on your bills, invoices, etc. NetSuite provides you with high-levels of customizations, which can be done without any coding. Make sure that you don’t lose out on the flexibility of the system for the sake of customizations. NetSuite allows both customizations and flexibility to exist simultaneously, thereby providing you with scope for changes as your business evolves. Make sure to choose the right NetSuite implementation partner, who helps you get the most out of your ERP system. Your Netsuite partner should be able to guide you through your customization requirements, while keeping the long-term sustainability of the system in mind.